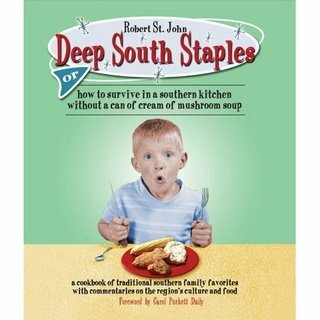 The Sun Herald in South Mississippi has a look at the new book Deep South Staples by Robert St John, and provides this list of 10 tips from the book as a sample of the handy ideas and hints that you will receive from this publication which promises to show you "How to Survive in a Southern Kitchen Without a Can of Cream of Mushroom Soup." Deviled eggs: In order to avoid deviled eggs that are too large for the mouth, use the smallest eggs possible, then after boiling, cut a nickel-size slice from each end to stabilize them. Halve the eggs crosswise, not lengthwise, to make them small enough to eat gracefully. Vidalia onions: Because of the high sugar content, Vidalia onions spoil easily; always store them so that they are not touching each other. Exfoliate: Use rough textured bathing or exfoliating gloves to quickly and easily clean root vegetables such as potatoes, carrots and beets. Baking powder: In order to test the potency of baking powder, mix 2 teaspoons into a cup of water. If it fizzes or foams immediately, it is OK. If the reaction is at all delayed, buy a fresh can. Fried chicken: Putting several pieces of celery with leaves into the oil when frying chicken produces beautifully colored and better tasting fried chicken. Boiling water more quickly: Speed up the process of boiling large quantities of water by boiling water in two pots, fore example, a half-full stock pot and a second pot with the balance of the water needed. Both will boil more quickly and continue to boil when the second is poured into the stock pot. Stuffed peppers: Two ways to keep stuffed peppers upright during baking are to put them in a tube pan to ensure a snug fit, or in a muffin tin to prevent sliding. Keeping a cookbook flat: Put a clear glass Pyrex dish on top of open cookbooks to keep them flat, readable and clean while cooking. Separating fat from drippings: To separate fat from pan drippings, pour all the liquid from the roasting pan into a glass measuring cup. Carefully slip a transparent bulb baster beneath the layer of fat and pull out the juices into the baster. Still Got Some Eggs Left?